Winter Weave-Along — Noel Banner and more . . . If you’re not a member of the Facebook Pin Loom Weaving Support Group, you might want to join. We’ve got such a great group of creatives over there I can’t keep up with all their ideas. There are several options for our Winter Weave-Along project. 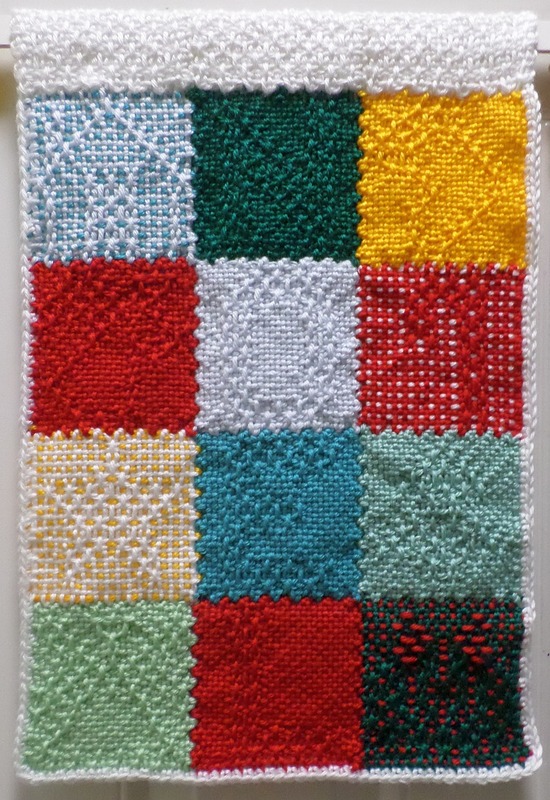 I’ll start with the basic idea which one of my Facebook pin loom buddies, Sarah Hluchy, contributed. It’s a variation on the Fall Banner. First decide on your colors—maybe you want a hodge podge of different colors, maybe you want them to coordinate with each other. You might want all solid colored squares, all two-or-more-colored squares, or a mix of both. There’s also the option of adding beads to consider. And don’t forget the sparkly yarns! Next, decide on the motifs you want in the banner. There are lots to chose from. 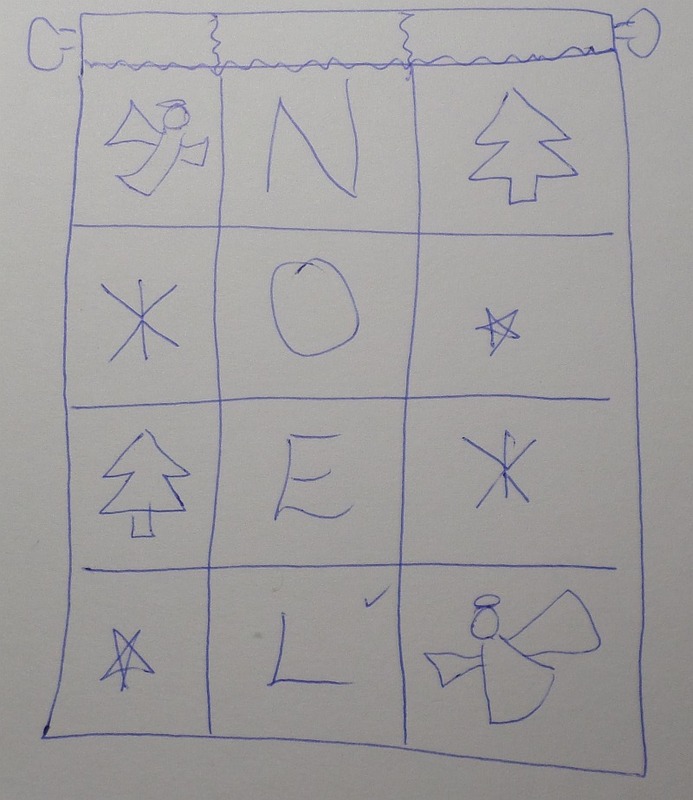 Noel Banner with several options for the holiday motifs—this was my first attempt on the letters N and O; I’ve since redesigned them (see below). Bottom Row: “I Am Like a Star,” L; Oh, Tannenbaum! 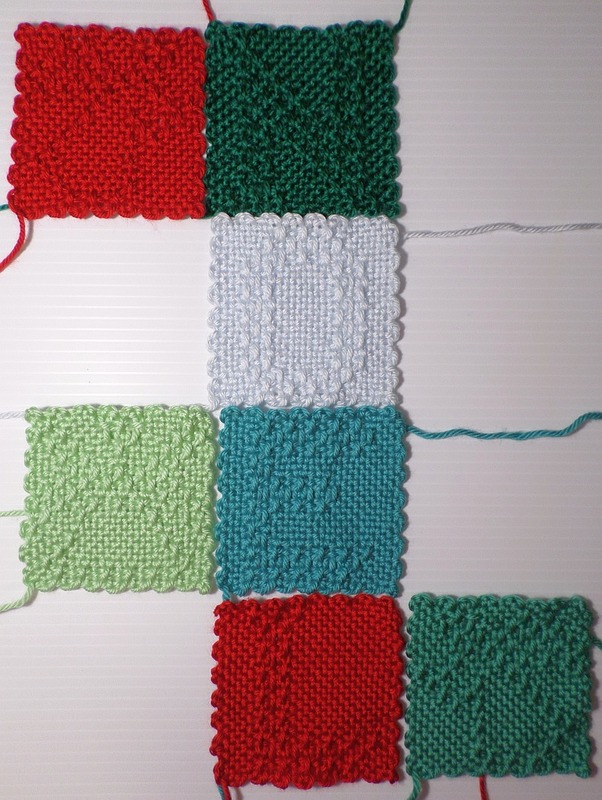 When you’re ready to start joining the squares, this tutorial might come in handy. Click on the links for instructions on how to weave the patterns. Here’s my banner so far (subject to change). I want to try some of these new designs in two colors to see if they’ll show up better. Another option is to spell different words. 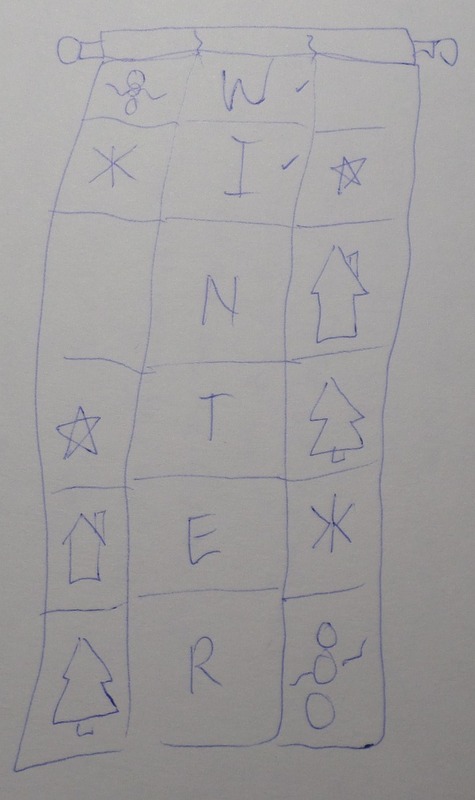 I’ve designed letters to spell WINTER, FAMILY, JOY, LOVE . . . (other letters still to come). You might make a longer or horizontal banner, or a table runner. You can add plain weave squares, all-over patterned squares, 2″ squares, and whatever else you can think of. Another FB PLWSG member, Barbara Mercier, used 2″ squares as a colorful border around the outside edge of her beautiful Fall Banner and matching table runner. 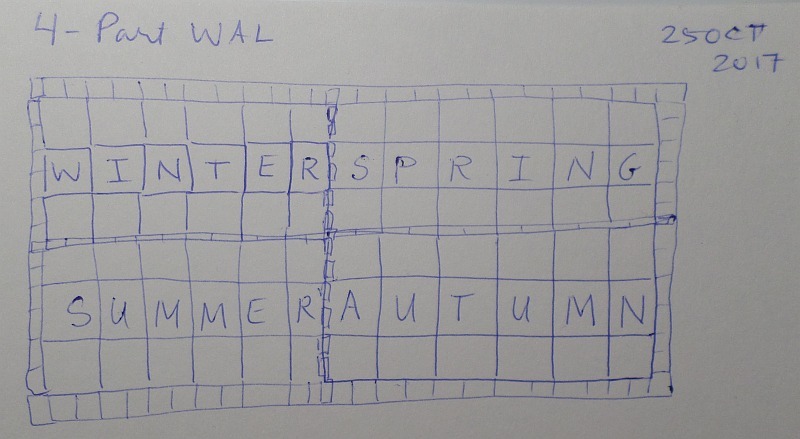 I have plans to make a Four Seasons Blanket. I’ll use motif squares and seasonally colored plain weave squares, and maybe some of the patterns I design between now and next winter. 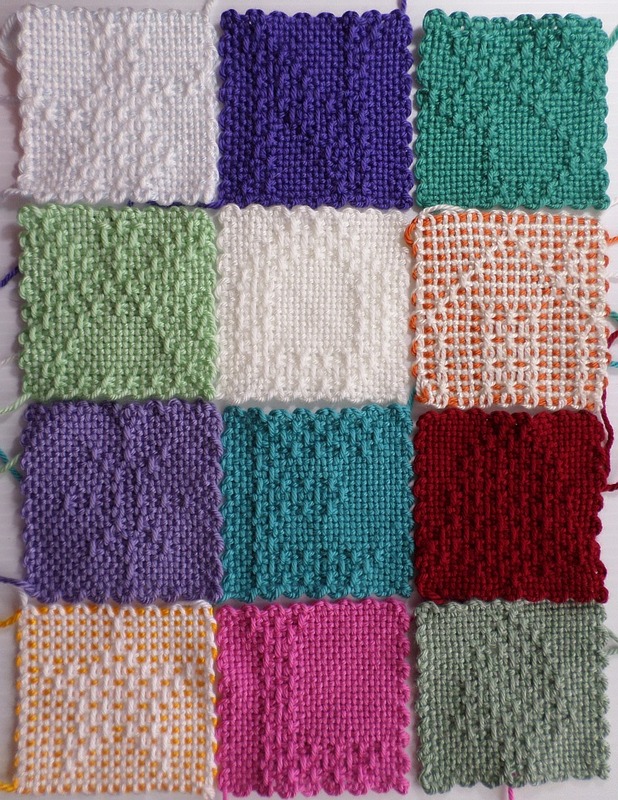 I might use 2″ squares as a border around each season. I finished my banner. I added a row of single crochet around the entire outside edge. When I sewed the hanging sleeve across the top edge, I let the scalloped edge show just barely over the woven squares, but not enough to cover their designs; the crocheting gave me something to sew into. I used the 3-and-1 pattern for the hanging sleeve squares.